On 22 March 2014, the Post Office of Moldova (Poșta Moldovei) issued a series of postage stamps with the title EUROPA 2014 - National Musical Instruments. The issue comprises two stamps, with associated cancellation (postmark) and first day cover (FDC). The designer was Vitalie Roşca. The printing was performed by Nova Imprim, Chişinău. The cimbalom is a concert hammered dulcimer: a type of chordophone composed of a large, trapezoidal box with metal strings stretched across its top. It is a musical instrument popularized in Hungary and commonly found throughout the group of Central-Eastern European nations and cultures which composed Austria-Hungary (1867–1918), namely contemporary Belarus, Hungary, Romania, Moldova, Ukraine, Poland, the Czech Republic and Slovakia. It is also very popular in Greece. 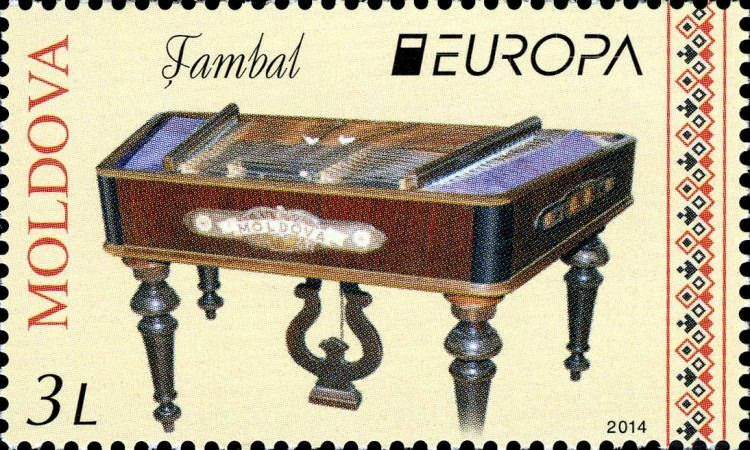 The cimbalom is (typically) played by striking two beaters against the strings. The steel treble strings are arranged in groups of 4 and are tuned in unison. The bass strings which are over-spun with copper, are arranged in groups of 3 and are also tuned in unison. Read more.. This article uses material from the Wikipedia article 'Cimbalom', which is released under the Creative Commons Attribution-Share-Alike License 3.0. 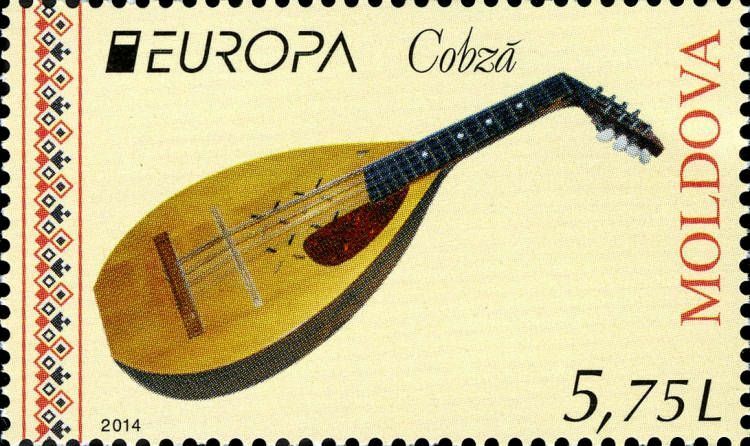 The cobza (also cobsa, kobuza, kobuz, coboz or koboz) is a multi-stringed instrument of the lute family of folk origin popular in Romanian, Moldovan and Hungarian folk music. Read more.. This article uses material from the Wikipedia article 'Cobza', which is released under the Creative Commons Attribution-Share-Alike License 3.0.